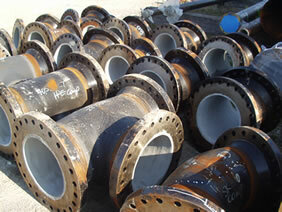 X-Pando | Cement Lining Company, Inc. 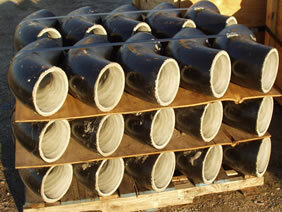 The Premier Product for Sealing Cement-Lined Pipe Joints to Be Welded! Expands as it sets, producing a tight joint. Originally developed for one petroleum company to seal the inner linings of cement-lined pipes while the outer metal was being welded. 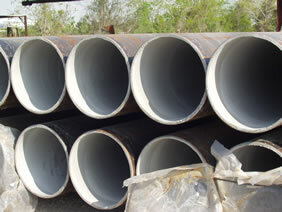 X-Pando is now the preferred product in the water and oil industries because it produces a high quality leak-proof connection. It is easy to apply and specially formulated to be compatible with the heat requirements of welding. X-Pando is non-toxic and certified by the Underwriters Laboratory in accordance with ANSI/NSF standard 61 for drinking water. 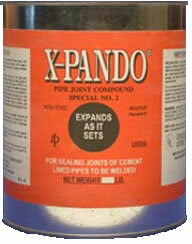 2 Mix the X-Pando with clean water until it reaches a consistency of heavy paste. Mix only as you use it. If the material becomes too hard to apply freely, discard it and make a new batch. Do not mix more than you can use in one hour and do not add water to an already hard mix. 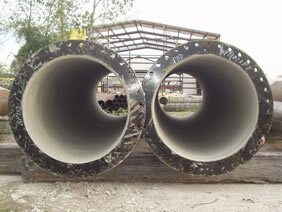 3 When the cement lining has been brought flush to the end of the pipe and fittings, wet down the edge of the cement lining with clean water. Using a brush, squeeze bottle, or spatula apply the XPando#2 to the face of the cement lining. 4 Bring the two ends together with welding clamps. Remove any excess X-Pando (dirt, oil, or grime) from the outside of the steel surface to be joined. Tac weld as required to hold the pipe in proper alignment. 5 Allow the X-Pando to dry or pre heat the area to about 250 degrees for a few minutes to remove the moisture from the X-Pando. Do not overheat or the X-Pando may become too dry and tend to pulverize. Allow to cool slightly before welding. © 2014 Cement Lining Company, Inc.